SCT2001 series are replacement of JST PH connectors. 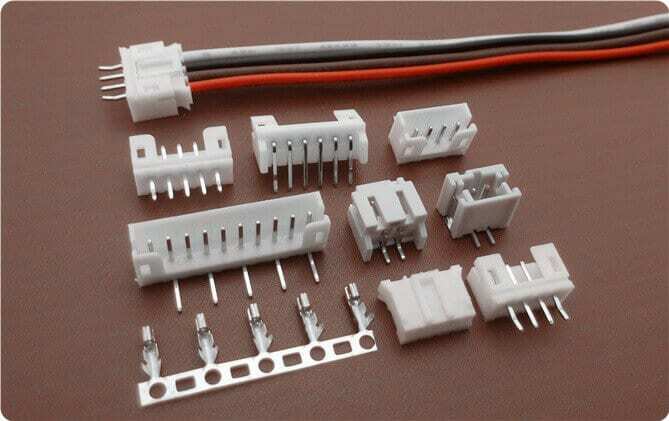 2.0mm pitch, It's widely use wire to board connectors. Fully shrouded header, crimp style. The 2.0 mm JST PH connector is a low- profile and compact component delivering dependable service in requirements for high density connection to printed circuit boards. Delivers up to a current rating of 2.0 A and 250 V, applicable for American Wire Gauge (AWG) #24, #25, #26, #27, #28, #30, #31, #32. This is offered in different models and in various dimensions, with top or side entry configurations which might suit your specific needs. Top entry configuration consumes a minimum of 8 mm x 4.5 mm mounting height and width, respectively; while side entry configuration consumes a minimum of 4.8 mm x 9.6 mm mounting height and width, respectively. In addition to the above flexibility in configurations of the 2.0 mm pitch connector, Scondar also offers this connector with different number of circuits ranging from 2 to 16 which would suit your specific needs. No alloy was used in fastening the wires to the board, but through the use a crimping method, which makes it more flexible and mechanically stronger. Furthermore, it prevents the cables from being easily disconnected due to entangled routing, heavy loads or vibration. There’s a dimple at the center of the contact which ensures positive contact and low contact resistance at all times. Insulation resistance and contact resistance are of 100 Mega ohm per minute minimum and 20 Mega ohm maximum, respectively. The 2.0 mm Pitch Connector can be used for AC and DC operations with a rated current of 1.0 amperes and 50 Volts. It is applicable in both chassis wiring and power transmission wiring. 2.0 mm pitch serves as the best choice for densely crowded electronics systems for its small, square-edged configuration, ruggedized and shock resistant feature. This connector can either stand as power contacts, signal contacts or both as power and signal contacts or a signal and grounding contact. The wiring harness interconnects the PCB to various components that sends signals and power to other electronic devices. 2.0 mm pitch connectors ensures safety, system protection and performance with its bonded metallic conduits and multiple grounding points preventing fire hazards, component damage, overheating and possible electrocution. 2.0mm connectors are for not only suitable for densely packed equipment requiring weight reduction and downsizing but also for automotive connections, built to be robust in tough and harsh conditions. 2.0 mm pitch connector are also popular in batteries such as in rechargeable battery packs, battery balancers, battery eliminator circuits. Battery connections rely on the ability of the current to pass reliable and solid current. This prevents overheating in the circuit and voltage drop.